Designed to satisfy the highest requirements in regards to aesthetics and comfort of use. The design gives a nod to the current architectural trends. High-quality wood, modern glass elements and the care for scrupulous treatment of details emphasize the fine look, both inside the sauna and in its surroundings. The heart of the sauna is a HUUM heater, which fulfills the highest standards with its external appearance, smart features, and the quality of materials and workmanship, as confirmed in multiple tests. 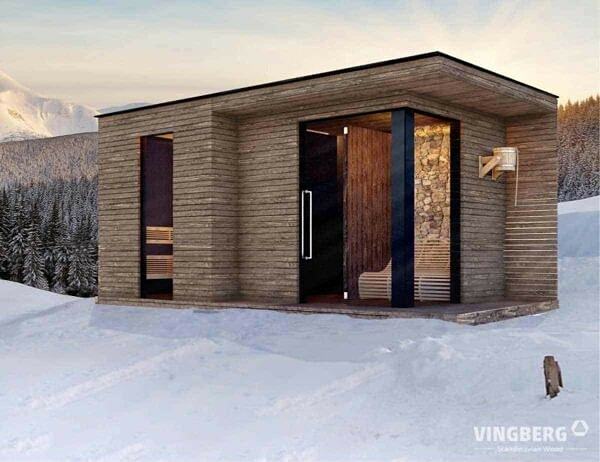 The basic version, which includes a sauna, a shower and a vestibule, can be additionally extended by a terrace.